Mushrooms have grown wild since prehistoric times, having been consumed as food by the early hunter-gatherers. The Egyptians thought that they granted immortality, and since only the pharaohs were felt to be worthy of this gift, the common people were not even allowed to touch mushrooms. The folklore of many cultures, including Russia, China and Mexico held that eating mushrooms could give someone superhuman strength. While often thought of as a vegetable and prepared like one, mushrooms are actually fungi, a special type of living organism that has no roots, leaves, flowers or seeds. There are three different types of button mushrooms. 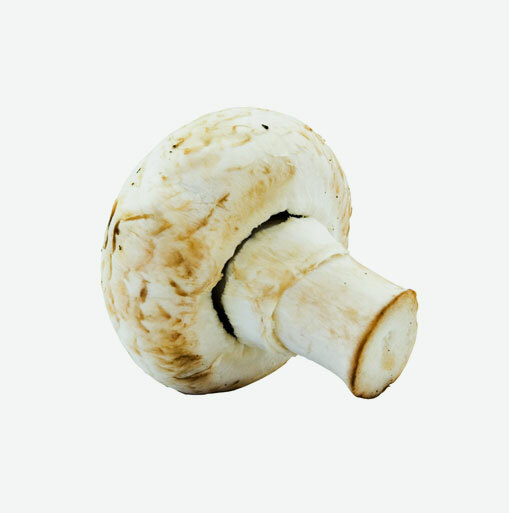 The white mushroom is the most common type and is the cream coloured mushroom that often adorns salads and veggie trays. The Crimini mushroom, which looks just like the button but is coffee coloured, actually features a more distinctive flavour. The Portabello mushroom whose large size and meaty flavour make it a wonderful vegetarian entrée is actually an overgrown Crimini mushroom. Mushrooms are a very good source of zinc which affects many fundamental processes, perhaps the most important of which is immune function. It is also important for wound healing and stabilizing blood sugar levels and is responsible for our sense of smell and taste. Look for mushrooms that are firm, plump and clean. Those that are wrinkled or have wet slimy spots should be avoided. Since mushrooms darken as they age, choose those that are either creamy white or tan, depending upon whether you are purchasing white or Crimini mushrooms. The best way to store loose button mushrooms is to keep them in the refrigerator placed in a loosely closed paper bag, wrapped in a damp cloth or laid out in a glass dish that is covered with a moist cloth. These methods will help them to preserve their moisture without becoming soggy and will keep them fresh for several days. To clean mushrooms simply wipe them with a slightly damp paper towel or kitchen cloth. If using the whole mushroom in a recipe, simply slice off the very bottom of the stem, which is usually a bit spongy. If your recipe only calls for the caps, gently break off the stems with your hands and discard (or save for making soup stock). Healthy sautéed mushrooms and onions in some extra virgin olive oil make a great side dish to meat dishes. Add finely chopped mushrooms to a pot of tomato pasta sauce. Remove the stems from mushrooms, stuff them with your favourite vegetable medley or soft cheese and bake for about 10 minutes in the oven at 350F. Add mushrooms to your omelets and jazz up this breakfast favourite.